“I like being with animals,” says Lliwen Roberts from Cerrigydrudion, a village east of Snowdonia National Park in North Wales. 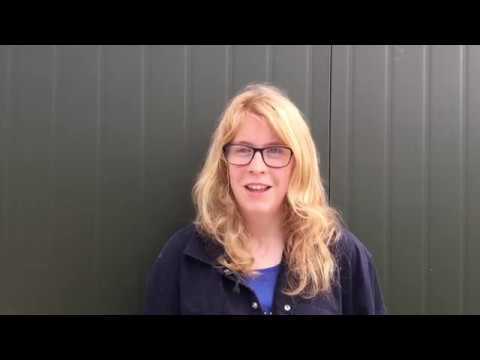 “I did a Small Animal Care course at Northop College.” Now her favourite part of her job at Derwydd Eggs, a farm near Llanfihangel Glyn Myfyr, is being with the chickens, although she emphasises that she likes everything about the job she has now had for just over a year. Lliwen has a learning disability and works three mornings a week. At this time of year, she starts by picking out eggs from the belt that have been laid during the night. She follows this up by checking on the chickens in the shed, making sure they have enough water and food, and assessing the wellbeing of any chickens that may be ill. Once that’s done, there could be as many as 50 eggs to collect. She checks the machine to make sure there are no cracks or dirt on the eggs. She repeats the process and eventually finishes by cleaning up, leaving at around midday. “She has been a big help,” says Llyr Jones of Derwydd Eggs. “She arrives promptly at 7am every morning, still a little bit before me in the morning, she’s very good about that!” Lliwen agrees that time management and punctuality are some of the skills of which she has learned the importance and developed during her time in the job. Llyr also praises her willingness to swap shifts with others and help out if the farm is short of a pair of hands. Lliwen has a real passion for animals and being around them, so this was the perfect job for her. Llyr thinks that one of her strengths is the way that she spots when the chickens are unwell and takes care of them. Lliwen was also present during lambing season, changing bedding and bottle-feeding lambs. The support from Sioned was intensive at the beginning, and she helped Lliwen initially to learn how to complete her day-to-day tasks. “It was really good,” Llyr says of the support. “Sioned would arrive at 7am every morning and would be with her every day for months.” But Lliwen’s confidence and capability has reached such a level that Sioned has been able to taper off her support and now checks up on both employer and employee via phone or the occasional visit. Llyr believes that the Engage to Change project enabled him to employ someone with a disability. “Definitely. At the beginning I was wary, not being sure how much responsibility I could give to Lliwen. But Sioned was there to help and to show us the way, and it’s turned out to be a great idea.” He hopes to expand the farm to two sheds, and in the process, be able to extend Lliwen’s hours. This story has been featured on the Big Lottery Fund’s Big Blog.